Monitor folder and file activity Automatically perform backup operations. Innovative app gettings from the best in download sites! Use the called for software program sections, watch the most recent versions of the featured solutions, and get immediately! Do not lose chance to recieve the popular software program: employ SoftEmpire to try software solutions for free. Meet the catalog of shareware and software application test versions. take among computer tools, get planners, firewalls, and all other kinds of utilities for your laptop or mobile phones! xDiskSpy is an ActiveX control that you can use in your Visual Basic, C++, VBA, Delphi applications. xDiskSpy Monitor folder and file activity. is an ActiveX DLL that allows you to monitor folders and files, by setting filters you want to be notified about. You can monitor file reads and writes; attributes, security, file name and file size changes, and folder changes (delete, rename, move, etc..). xDiskSpy Automatically perform backup operations only on modified files. with xDiskSpy any kind of file activity performed by any application is caught by the component. xDiskSpy can be used to detect situations where viruses modify your system files, or web sites add cookies and other files to your system. It can also be used to notify you that a shared file has been updated and the changes need to be reviewed. It was designed to be as programmer-friendly as possible, by providing features such as no user input to run in the background and event-driven notification. 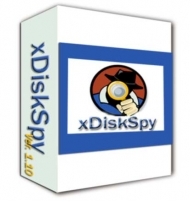 xDiskSpy is the leading component for monitoring disk activities on your application . Powerful encryption software with pre-boot authentication secures 100% of your hard disk drive, including the OS. Secure Disk provides the ultimate security standard for encryption at the physical sector level.